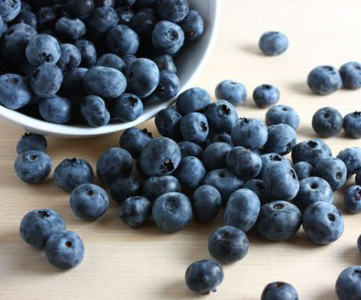 There is good reason Blueberries are celebrated as a Superfood – high in vitamin C and potassium and a good source of Vitamin E, blueberries may reduce the risk of cardiovascular disease, improve cognitive function and support a healthy immune system. Incorporate blueberries into a green salad along with goat cheese or feta cheese and a lemon dressing. Combine crushed fresh pineapple, blueberries, and a tablespoon of jam to make a sauce topping for waffles or pancakes. Add to smoothies and shakes. Garnish whole grain salads made from couscous, barley, faro or bulgur with parsley and blueberries. Dress up plates of seafood or poultry by adding a spoonful of fresh blueberry relish, made by combining diced pickled onion, blueberries, and diced tomato. Toss blueberries and a bit of bleu cheese with arugula and vinaigrette for a special occasion salad. Blend together blueberries, Greek yogurt, and a few slices of candied ginger to make a dipping sauce to serve with sliced apples and berries. Source: Mediterranean Foods Alliance. Oldways. In a blender container, combine half the blueberries, the oil, marmalade, lemon juice, mustard and salt; blend until a smooth, thick dressing forms. Core and slice the apple. Arrange spinach, apple slices, celery and pecans on cold salad plates; top with remaining blueberries if using fresh. Blend dressing again until smooth and drizzle each serving with dressing.